My digestion has been a bit out of whack over the past few months. Actually, I’m feeling a bit out of whack as a whole. Maybe I was naïve, but I really didn’t anticipate the postpartum phase to be so challenging, on many different levels. The pregnancy seems to get the most attention while the period after having a baby seems to be all about getting back to your old self as soon as possible. At least in the media. I guess I expected that for myself too, but it’s not my personal reality nor is it for many other new moms I’ve talked to. We’re almost 5 months in and I still don’t feel like I have it together. I mostly blame the overnight waking hours and sugar cravings (the cravings result from lack of sleep – it’s a vicious cycle), but it’s everything really. Life has changed in so many weird and wonderful ways. I wonder if I ever will feel like my old self, or if I’d ever want to; what I have right now is great. I say it all the time but motherhood is amazing. I pinch myself so many times a day…like, do I actually get to witness this sweet baby discover the world? It’s the kind of thing that fills my heart with so much joy it keeps me up at night because I know that it could all be taken away in a second. The intensity seems to be lifting as the months go on. We are laughing so much every day! I’m convinced Adriana is a 90 year old woman trapped in a baby’s body. Seriously…she does this lip-sucking in thing that makes her look like she forgot her dentures. I die every time. She is my number one priority and because of this I think I have let my own self fall to the wayside. It’s the cliché saying about motherhood, but it’s been so true. For me, this seemed necessary to get through the first months as a new parent, but I’m getting to that place now where I think I can find a balance for both of us. The fog is lifting. This is where a plant-based diet can help in so many great ways! I think I’ve done a good job of staying healthy this past year, but there are a few things I would like to improve upon. The advice I often give to others is to make small changes when starting out, so that’s what I’ve been doing recently. Just a bunch of little tweaks that all contribute to the whole. Baby steps. Rather than having caffeine in the morning (which doesn’t seem to agree with my anxiety-prone nature), I’ve switched to a tea made with fresh ginger, fresh turmeric, and Rooibos tea. I drink it all day long. A few other things I’m doing (almost) everyday – green protein smoothie, exercise, probiotics (plus my other regular vitamin regime), and hitting the hay earlier. There’s nothing ground-breaking or gimmicky here, but they are things that just WORK time and time again. Sure there are days when none of these things happen, but for the most part it’s helping! While this smoothie is different from my regular morning protein smoothie, it makes for a lovely afternoon snack. You could probably add some hemp hearts to this one if you wanted to boost the protein enough for a morning drink. // Pineapple // Digestive and anti-inflammatory benefits, immune support. One cup gives you 105% of your daily Vitamin C requirements. I use frozen pineapple chunks in smoothies to save time. // Fresh ginger // Soothes the intestinal tract and helps with digestion. Awesome for all kinds of gastrointestinal relief, such as morning sickness. Anti-inflammatory and immune boosting. // Fresh parsley // Rich in vitamins K, C, A, folate, and antioxidants. It’s a natural diuretic which can help release water retention. Opt for flat-leaf parsley as it’s less bitter than curly parsley. Cilantro would be a nice swap here too! // Avocado // Major anti-inflammatory benefits + heart-healthy fats. High in fibre which aids with digestion. // Banana // Rich in B6, manganese, Vitamin C, fibre, and potassium. Interesting to note – while bananas are high in sugar, they have a low glycemic index score which means that they won’t spike blood sugar levels. It’s soothing to the digestive track and thought to regulate the bowels and enhance friendly gut bacteria. // Lemon // Rich in vitamin C. Aids digestion and helps flush out toxins. I also add some coconut water and probiotic powder for an extra boost! Feel free to add a handful of spinach or kale too. 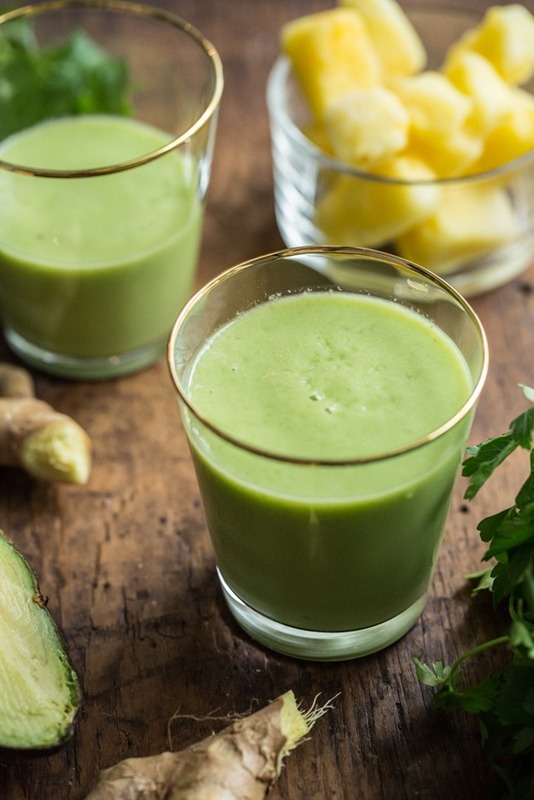 This green smoothie is packed with digestion-enhancing and immune-boosting foods like pineapple, parsley, ginger, and avocado. Don't worry though; its sweet flavour makes it friendly for green smoothie newbies! If you are adverse to the spiciness of ginger, I recommend starting with half the amount and adding to taste from there. This smoothie also keeps well overnight. I will often make a double batch, save leftovers in a small mason jar in the fridge overnight, and enjoy it the next morning. Feel free to add a handful of baby spinach to boost the nutrient power even more. Fresh mint also gives this smoothie a nice digestion boost (not to mention a delicious minty flavour). PS – I had the pleasure of being interviewed by Publisher’s Weekly recently – hop on over and read the interview here! Looks amazing! Can’t wait to test it out! Ditto that Christine. I’m a teacher in Buffalo, NY and we had another “cold” day. Therefore I’m home with the kid’s and can make everyone this Happy Digestion Smoothie. This looks absolutely divine! My gut health has been pretty good lately and I want to keep it that way. I will be whipping this up this morning! Yumm! I love frozen bananas in smoothies — makes them taste more like a dessert. :) I’ve had troubles with digestion over the last few months as well, and never thought of putting probiotic powder in my morning smoothie. What brand do you like? I absolutely agree, there is so much emphasis put on pregnancy but no one talks about once the baby comes. After four months I’m starting to feel the fog lift but it was a long few months! Our baby slept 5 hours straight at 6 months to the day she was born. She had colic and all sorts of digestion issues and now I wonder, if my wife was eating super healthy digestive foods (and smoothies like this) if that would have helped. I tried to help my wife through the postpartum stage as much as I could, but it’s hard to understand being a guy ~ I didn’t give birth and can’t imagine what that would be like! I don’t think I could do it so hats off to all of you moms, that’s quite an accomplishment. I am a mother of 3 ( and 2 Angel Babies) and i just read your comment and wanted to tell you THANK YOU SO MUCH for what you said! I really appreciate it and love hearing a father say he helps as much as he can because as you know, it can be hard at times! But i give it to father’s like you too because you play an awesome role too :). Thanks girl :) And I agree! Was just about to email you. I can’t wait to try this!! I just made my favorite smoothie (kale, banana, pineapple, milk, ginger) which is so similar. I know this post is about the smoothie, but I love the idea of the ginger/turmeric/roobis tea, I think I need to give it try! I’ve been trying to decrease my caffiene intake and find different things to replace coffee (I say this as I’m drinking a large Tim Hortons coffee…ha), how much ginger/turmeric do you put in? It usually varies…sometimes I’ll make a huge pot so I will add a lot (a couple tbsp grated ginger and 1 T sliced turmeric maybe) with a few servings of loose leaf. If I’m making just 1 mug (which I rarely do) it will be much less. I might have to do a post about it! I’m not loyal to one brand in particular – I like to rotate them now and then! Innovite probiotic powder and Bio-Kult are two I’m using lately. I’m intolerant to bananas. Could I swap for something else or take it out completely? Thank you! I would probably increase the avocado to 1/4 cup if leaving out the banana to ensure that it’s still nice and creamy. You might want to consider adding a bit of sweetness from another fruit to make up for it since the banana adds a nice pop of sweetness. I dislike bananas so I’ve always used applesauce to replace them in recipes (such as baking), and using frozen cucumber to replace in smoothies. It doesn’t replace the sweetness, so you may need to find a little something else for that, but they are decadently smooth and creamy and add a very fresh taste! The recipe sounds awesome and despite being a dude I really appreciate the rest of the post as well. I made your chocolate pie (as I call it) last night…this morning I made us your hot overnight oatmeal (awesome) and as soon as my little guy (11 months old) gives me a chance (mom is currently busy doing a yoga routine), I’ll get at making your roasted tomato soup which we’ll be having for lunch followed by pie for dessert…NOM NOM NOM ! It’s my wife’s 34th b-day today so I am pulling some stops out… as a matter of fact she’s getting your book…and an apron :-) Seriously girls the apron was her idea… but I am absolutely good with that… big fat surprise! Anyways, thanks for all that you do and all that you are. Keep up the incredible work. Best to Eric and your little gem. Wow that’s so nice!! Happy b-day to your wife. Thanks for all your support. :) You don’t know how happy it makes me to see a comment from a man once in a while, hah. Hi Angela! I have a 6 month old daughter and this post took the words right out of my mouth regarding the postpartum period! It was almost like reading my own journal! Thank you for this recipe, can’t wait to pick up some pineapple and give it a try! This looks soooo tasty! Just a warning that a lot of parsley can decrease milk supply. I wouldn’t worry though if you haven’t noticed a change! Also, you are so right. That new motherhood fog can be tough. It does end though – I promise! I’ve heard this too, but I was told it was only in large amounts – I guess it varies for everyone though! I also heard this, and I heard the same about avocado and banana – which I eat every single day! And peppermint, which I love. Seriously if I want to keep my milk supply I am going to need to eat nothing but oatmeal and brewers yeast…this smoothie looks amazing though. My brother in law makes homemade kimchi and kombocha, both of which are loaded with probiotics! So so so good. Avocado makes your breast milk so rich and fatty…babies love the taste! I eat one every day and also a bit of banana every day too. Not sure whether they impact my supply but shes gaining lots of weight. :) That being said, oatmeal tends to really increase my supply if I eat it daily. Perfect timing! I have been experiencing the worst indigestion when I teach at a studio. Every week the same stomach ache (am I allergic to my job?). I must make this part of my Tuesday routine. 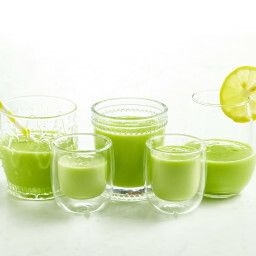 We (my husband, 2 kids, and I) love green smoothies and this one looks to die for. Thank you for the recipe, Angela! A good digestion tip that I picked up during Nutrition School is to start the day with a glass of water and juice from 1/2 lemon. It not only helps the body detoxify, but also makes you go to the bathroom (with number 2 :)). 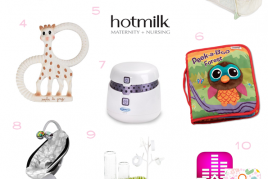 As for post-partum weirdness, I don’t have kids (yet — fingers are crossed this changes soon! ), but I know that even slight shifts in my hormone levels can make everything feel intense. And if those slight shifts can have such a profound effect, I’d guess that the *huge* shifts new moms undergo would feel nothing short of seismic. So, it’s totally understandable that it would take you a long time to feel like things are smoothing out. (I mean, I wept almost non-stop while watching “Annie” in the theater a few months ago, and that was just PMS.) And that’s to say nothing of the sleep deprivation, which can make even the most stoic person feel like they’re losing it. I have no idea why the media perpetuates this myth that women give birth, shimmy back into their pre-pregnancy jeans, and carry on as if things haven’t changed that much — but it seems ridiculous, and it’s fantastic that you’re describing what’s *actually* going on as you adjust to new motherhood. It’s also great that your routine of tea, nourishing foods, and exercise are helping you through this adjustment period — hang in there, and know that I’m sending hugs from afar! Yea the hormones are insane for sure! Luckily I have managed to avoid the blues for the most part, but the days where I don’t sleep enough I feel it more. Is it summer yet??? 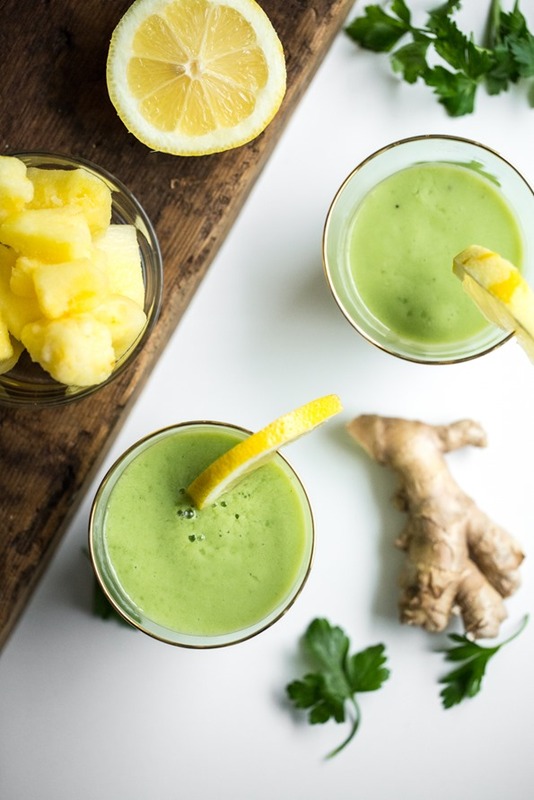 I love this idea for a smoothie – particularly the combination of tummy soothing ginger with the enzyme rich pineapple. What kind of probiotic powder do you use? I have purchased GoodBelly probiotic a few times, but it would be much easier to add the powder to the green juice we drink in the morning. Have you noticed that dropping caffeine has helped with anxious postpartum feelings? I had anxiety after my son was born. I call it postpartum insomnia because while he was sleeping through the night from week 1…I was up all night. UGH! Switching from a veggie diet to a vegan diet helped. Dropping the dairy helped with the anxiety and let me sleep much better…but I wouldn’t say it’s 100% gone. maybe 90%. maybe dropping my morning coffee would help it out that last 10%? Hi Beth, Yes I definitely think I have less anxiety when I don’t have caffeine. I think it depends on the person, but I’ve never been overly good with caffeine. As for probiotics, I vary them up quite often but right now I’m taking Innovite powder and Bio-kult capsules (which easily open up). I’m glad to hear that the heaviness is lifting a little bit every day and that you’re being gentle with yourself in the process. I don’t have kids but I know that my digestion is SO related to my stress level and schedule – I can’t even imagine what it would be like adding a baby to the mix. 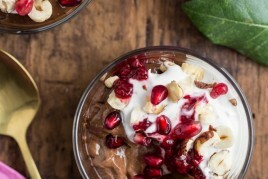 Bookmarking this beautiful recipe and will try it out soon! Thanks for posting, Angela. Do you have a recommendation for a probiotic powder brand/type? There are so many choices! I am allergic to banana, what would you suggest as an alternative to banana in your smoothies? I usually use frozen avocado, but in this case there is already avocado in the smoothie. Thanks Angela!! Thanks Katie! I suggested to another reader above to try increasing the avocado to 1/4 cup to ensure it’s still nice and creamy when leaving out the banana. You might want to add sweetener or another fruit to taste too. I think what you’re processing is beautiful. I’m actually excited for motherhood because I know it will help me stop having the mindset that a perfect diet and body is achievable. There are more things to life than watching everything we eat and how intense of a workout we can get in. I think Mom’s are blessed to gain a different view of life! Agreed :) It’s been refreshing for sure. Yum, I cannot wait to try this soon! I know my husband will love it too! Sounds delicious! Definitely something I must try! This smoothie is just what I needed, Angela! Though I haven’t recently had a baby (lol not at all!) I’ve also been feeling a bit out of whack lately and need something like this to help me get back on track! It’s funny how small changes (giving up caffeine was a big one for me) can make such a difference! Wishing you a wonderful week! Definitely perfect to brighten up any morning…and great for flu season! I think this is just what I need. I don’t half of the ingredients, but I have the important ones! I’ll make some subs and give it a go. First congratulation and welcome to real life! Mom life! I have four of my own . I Love everything you write and everything you do. I know everyone will give you bits of advice on what to do etc… I remember hating this part of being a new mom! The only thing i regret being a stay at home mom is … i thought i had enjoyed every moments and i did but its never enough? When these cute older “nice women” would stop me and say” you are lucky ! Take your time and enjoy it! It goes by sooo fast ! ” i believed them and i did savour every moments but now that my baby is 11 and i look back, im like… Where did time go? I was so much in my mommy bubble and busy with chores , food prep , laundry etc.. Which is called life! It really flew by. Even though we would stop at every puddle of water after a rainfall… Smell every flowers along the path on our way back home after a long walk in the woods with the dog, after watching my baby sleeping for hours just to realise it was supper time ! I used to call these my little waste of time ( good waste of time ). I still feel today that it wasnt enough! I still miss those baby days even though they were so tough at times ! Give yourself a break ! 5 months is nothing to get back on your feet and to be back to yourself? This statement makes me laugh as we all say that and all want that! The fact is that its impossible as you werent’ a mom before. Youd had never carried a baby in your uterus before, you never had to think of another human being that came from you before , you never had to care for your own blood before and the list goes on? If you had lost your mom, would five months be good enough to be back to your old self? The fact is … Duhh! No ! You would never be the same. Your life would be changed forever . You would eventually learn to live with it and move forward, but in five months? Not sure about that . For any big life changing experiences… A year of adjusting is actually normal and necessary. Please don’t skip phases , be not so great, not so organized, not so nice or happy . You are normal. enjoy and savor the changes , the ups and downs ,good or bad they are there to stabilize your new life and your new self . The real Angela is still there just in modification mode. I remember at some point not wanting my life to change just cause i had a kid that i kept focussing on going to all sorts of places so he would be used to me going everywhere and passing him to all , as i wanted him to get used to all of my friends and family etc… That at some point i realized that my first born was a few months old and i missed his newborn self ! It flew by. Thank god i had a second one ,third and fourth! Ha! Ha! Ok this is turning into a therapy for me hahah! Sorry i just wanted to encourage you and to tell you… To give yourself a break! Don’t be so hard on yourself. It’s ok to be off the track for a bit , sometimes you even have to change tracks or make your own ! Sometimes you even have to get off the track and walk baby steps. This reminds me of my best gift ever after having kids. Its now the family bible ! It’s the book by Dr. Seuss ” oh ! All the places you’ll go ” . I’ve used it for myself as a guide ,for my kids when they were going through tough times, for my sister inlaw when she got separated ( everyday i would send her a passage of where she was at, to give her hope) , i even used it as a grade 12 graduation gift for my godchild ( which made the usually though girl cry, as she understood the greatness of it! ) . If i could i would send one to you . Hopefully you already have it! Use it and see the depth in it :) ok so sorry im done with the lecture haha! I just want to say i love everything you do and write on your site and in your fantastic cookbook ! And im not even vegan … Yet! Haha! Have a wonderful journey! Sorry about my writting … The french acadian in me lol. This is so great. Thanks for your honesty and encouragement! I know what you mean about soaking up the moments but still not feeling like there are enough! I have a five month old as well – it’s so hard not to look forward to the next step (crawling, walking, etc). I’ve never been good at just living in the moment. Trying so hard to do this! I have a 4 month little one myself – and I feel just like you described in your first paragraph. Feel a bit turned upside down – and it is time to start making so little tweaks to find my balance. Do you use protein powder in your breakfast smoothie? I am still breastfeeding, and I don’t know anything about using protein powders while breastfeeding. Obviously I should check with my Dr., but I am curious as to what your recipe is! I love all the pictures! I recently have been craving green smoothies with more ginger in them, so I make one with chia, greens, apple, lemon, turmeric, and ginger almost every day. Idk where the craving came from, but so far I am loving it. It is super refreshing! Hang in there! I have a 2.5 year old. It has taken me two years to start to feel “normal” and I don’t think I will ever be my old self. Instead I’ve been replaced by a 2.0 version that has some improvements and some draw backs. I appreciate all your recipes! They have helped the 2.0 self find my way back. I now eat thanks to your smoothie (I couldn’t figure out how to feed myself with a no-nap toddler on the move). I can’t wait to try the new smoothie. I LOVE your thumb print breakfast cookie recipe. I make it with my toddler and I don’t have to worry about him licking the bowl. Thank you for creating recipes we can make together! My son was born the same week as your daughter so they are going through a lot of the same phases together. We call him Mildred when he has the “I lost my dentures face” on. It doesn’t help that he is a bald baby! I haven`t read you in a while, a long while, and it just makes me so happy to read this post, I have a 4 month old baby boy, and I exactly know how are you feeling, thanks for sharing this, It will help me a lot! Congrats on being a beautiful, healthy, and human mom! You described the postpartum period perfectly. Our little one is almost 5.5 months and there are many moments when I still don’t feel like myself, physically and especially mentally! Food is certainly medicine, especially after sleepless nights. Thanks for all that you do, you’re love of food and nutrition is wonderful. This was perfect! Creamy and smooth and delicious and just sweet enough Just what I needed, thank you! Sounds perfect for a fresh start of the day! I would also add some fiber (chia or oats). I bet it’s delicious! I’m glad you said it, but hardly anyone tells you about the months postpartum. I’m much further than you from that time (my “baby” is now 5) but all the talk is about pregnancy. I think I had this idea (or rather fantasy) that things just go back the way they were. As if! I’m not sure things ever get to the way they were before, but who is to say that’s a bad thing. This recipe looks great by the way.Thanks for sharing! Be careful parsley can lower breast milk supply! I learned the hard way after making chicken pot pie and adding some in my smoothie the next morning! I had no clue until I researched… too a good while but I got the supply back.. Thank you! My boyfriend and I often go through digestive issues, and we will definitely use this! Although not from having a baby, I had my routine change and I totally agree that making small changes really helps. This smoothie sounds perfect to help me make those tweaks to my diet. This looks delicious and so simple Angela! Not sure if someone already asked but are you bresstfeeding? I have a 2 week old and am cautious of what I eat/drink, but I would love to try this drink. Ginger, pineapple, and almond milk are one of my favorite smoothie combos! So good for the stomach. Love the addition of parsley too. Green smoothies for life! Thanks for being so up front and honest about your baby experience. As a vegan who sees motherhood in the future, I often wonder about how my diet will translate- it is lovely to hear your perspective on things! Any tips for eating when you’re going through early pregnancy sensitive tummy? Perfect flavour combo, great to get your tummy in gear and feeling great! The digestion thing, I still feel it. I think its because I naturally have a sensitive stomach and with the permanent lack of sleep/ and the excess of guilt/worry its become a permanent feature of life as a mother! I can completely relate. My pregnancy went well and labour was over in a matter of hours/days, but what followed, well I was completely unprepared. My son is turning 5 now and I can tell you, it not only gets easier, it gets better and better and better! Wishing you well and thanks for sharing this stunning recipe. Hi Angela! Wow do I ever appreciate your honesty and openness in this post. I’m 12 weeks post partum and I also still feel out of whack. I’m often quick to feel like something is wrong with me or with my body, but your post is a reminder that we need to be patient with our post pregnancy self! After my 1st born, I had such terrible gas (yuck). It was so embarrassing and it just added to the feelings of displeasure with myself and my new body. But, as everyone tells you, slowly but surely things go back to normal. You havnt talked about how pregnancy or post baby has impacted your body image or if it has triggered disordered eating/thoughts. I SO don’t ever want to go back to starving myself but, in all honesty, my post baby body ( and the 10 pounds I still have not lost) has made me hyper focused on food and I have a lot of negative self talk about my body. I would love to hear about how you are dealing with these issues if you are willing to share! Perfect! I need to experiment more with adding herbs to my smoothies. Because I’m buying for one, I don’t typically buy fresh herbs – I can’t use them before they go bad. Smoothies are a great way to use up that extra herbage laying around! Anglea, Could you possibly recommend a protein powder? I know you used to use the Vega Sport Vanilla/ Almond. But since you have discovered stevia does not agree with you, do you still use this one in your Green Monsters? Thank you very much!! This sounds awesome! Can’t wait to try it with fresh mint! BTW anyone interested, I just started taking an awesome probiotic..liquid, so easy to add to smoothies. Its called inner-eco coconut water probiotic. I’m allergic to pineapple, can I replace that with anything? This looks amazing! I bet it would taste great with a little bit of mint added in too – plus added digestive benefits! I love pineapple and mint together. Ohh my digestive is shocking so I need to give this a whirl, and I adore enjoy ginger! Some kind person told me the transformation in your body to make a baby takes 9 months and you should take 9 months at least to adjust to not being pregnant. It sounds like you are being gentle to yourself and coming up with positive ways to nurture your health. I hope it gets easier and easier for you! I have been going through a wicked period of indigestion and uncomfortable bloating lately. I don’t know why. Sometimes I wonder if my mostly-vegan diet is to blame and wonder if this is common for people who eat a lot of fruits and veggies and legumes. I love your ginger turmeric tea but can rarely find fresh turmeric-what could I do to substitute turmeric powder for the fresh? Also, do you have a vegan vitamin regime for non-pregnant or nursing women? – I would love to see what you recommend! I bet it takes a long time to begin to feel normal again after having a baby. But you’re on a wonderful adventure with her. I love the sound of this smoothie! Soo delicious. I’ve actually never added ginger or coconut water to the many green smoothies I’ve made in my day, so I’ll need to try that! Hope it makes me glow! Looks interesting. I don’t usually think about putting tropical fruit in smoothies but I should. I don’t know that you ever really get back to your “old self” after having a baby. My little one is almost 20 months now. I still have to make frequent bathroom trips, the baby bump never went away (probably never will :(), my belly button is gone forever, and I get nausea and dizziness worse than I ever did during pregnancy, although those last two get worse if I don’t get enough sleep, which is all the time. About 6 months ago I got laid off from my job. I walked into work on the last day feeling like a new me had just been born (it was a really exhausting job). I’m still figuring out what the new me looks like inside and out, but I feel like I’m making good progress towards putting the old me permanently in the past so that the new me can shine bright. Great recipe! I love adding pineapple to my smoothies. The enzyme in pineapple, bromelain, is such a great anti-inflammatory. Hi! First I want to say I am a huge fan. OhSheGlows helped me transition to veganism and gave me the inspiration to overcome an eating disorder and I’m eternally grateful. Your recipes are incredibly delicious and I make them all the team. But I just wanted to inform people about probiotics. In the US (I don’t know about Canada) probiotics and other dietary supplements are not regulated by the FDA (Food & Drug Administration). Unlike drugs, they are not always investigated by a reliable, unbiased third party that has the public’s best interest at heart. According to the CDC (Centers for Disease Control), “The manufacturers [of dietary supplements] need not provide FDA with evidence that substantiates the safety or purported benefits of their products, either before or after marketing.” (http://wwwnc.cdc.gov/eid/article/16/11/10-0574_article) This is not to say that companies producing probiotics and dietary supplements do not care about the health of the consumer; this means that even if they do care, the science behind their products is not necessarily sound. By consuming dietary supplements and probiotics, you may be consuming substances that are unsafe for your body. In addition, everyone’s gut microbiome (The ecosystem of microorganisms within one’s gut) is completely different from another person’s gut microbiome. What may be good for one person’s gut may harm another person’s. The microbiome is not at all well understood, even by the most accomplished microbiologists – what microbiologists do agree on is that it is extremely complex and puzzling. That is all. Happy Blending! I love reading your posts with “mommy thoughts” in them. Our little one is 2.5 months old, and it’s nice to get a glimpse of what’s ahead (and sometimes affirmation of what we’re going through now… like major sugar cravings!) Also, on the note of “things no one tells you,” I am infinitely more hungry now (breastfeeding) than when I was pregnant. I seriously feel like I stay hungry all day, and cannot consume enough protein (definitely add protein powder to smoothies, and eat about a jar of PB and almond butter every couple weeks… yikes!) I love smoothies, since I can make ’em fast (our little guy doesn’t like long naps), so I’ll look forward to trying this one. No one talks about post partum recovery! I felt like I was dying after my first, it was awful. And I know what you mean about anxiety. But yeah it does get better! It took me until maybe 7/8 months so to get enough of a handle on baby life that I could return to starting to think about myself. (In a nice way) Second baby took me more like ten months..but that’s just because I knew what to expect and didn’t put anywhere near as much pressure on myself. I think the whole ‘baby stage’ really does take a good year, its hard but you can’t really rush it. But then you get a toddler! Not sure which stage is better haha ;) at least then you both get some independence back. And eventually you can have a cup of tea without without worrying about scalding anyone! Love the tea idea! I make something similar.. Just heat up some almond milk and then add turmeric, cinnamon, fresh grated ginger, vanilla, and maple syrup or stevia. It’s a very soothing drink and takes away my cravings for coffee! What beautiful pics, they convey all that healthy goodness! This is right on time! I’m only two months in and between lack of sleep and terrible eating habits (both what and how often I eat) I need to get back to eating more healthy foods. Adding these ingredients to my grocery list. Hi! I didn’t know where to ask this, so I just thought I’d leave a comment. Have you ever done anything with topinambur? I’d be very interested in what your ideas for it would be. Thanks for posting all these amazing recipes, the warm salad bowl and the Thai inspired cucumber salad are my very favorite recipes ever! Hi. I enjoyed reading your thoughts on new motherhood. I think it takes 9 months to make a baby and two years to recover! :) Anyway, thank you for sharing your knowledge and thoughts on your blog. I am trying to get healthy and recover from a c-section delivery…my recovery is slow. Your blog gives me a lot of hope for eating better for myself. Thanks thanks thanks!!! I needed this today – the post more than the smoothie but will try that too- thank you! I laughed out loud about the “forgot dentures look”, my daughter does the same thing and I could never quite describe it until now! Wow! This sounds so delicious! I have two-year-old daughter and I have a lot of work at home with her and with the whole maintenance of the house. I don’t sleep well and drink a lot of coffee. I think that these smoothies are good alternative of the energy drinks because they give real energy from the vitamins in it. Thanks a lot for sharing! Brondesbury Carpet Cleaners Ltd.
Two things. First, I don’t think anyone has asked this yet, but how do you keep the avocado fresh after using only 2 T? A brush of lemon juice? Second, I suffered from PPD that developed into borderline PP psychosis because I waited way too long to get help. Please take care of yourself (I know you do, but I feel obligated to tell this to new moms.) I thought everything I was feeling was normal and it almost put me in the hospital. Not that you are necessarily feeling this way, you seem to be doing very well! And good for you! I hope it continues and you get out of that fog. Best wishes! This was breakfast this morning, and it was delicious. Definitely a great way to get the benefits of parsley while hiding the flavor (not a fan of the taste). The only adjustment I’ll make next time is to decrease the amount of ginger a little. It was really spicy. I agree that this would make a better snack than breakfast, although as Angela said, adding some hemp for protein (or I’m thinking a little coconut oil for added fat) would increase satiety. Be gentle with yourself as there will be time for balance but it not easy to do right now. You have your priorities in place which is great. As a new first time Mom, just getting through each day is an accomplishment – all of you are learning from this life changing experience. You are in a better situation than most because you focused on your health a long time ago. Try not to stress too much about things (oh how easy that is said). It is time with your baby and husband that matter. Sounds to me like you are an amazing Mom, she’s a happy baby. Enjoy each day, the ups and downs because you will laugh about them later. Don’t put a lot of pressure on yourself. You do need some moments to stop and just take in how different your life is. I remember many times asking myself where did I go? I’m a mother, a wife, a worker – but where is me. That will come back, trust in that. Sounds great, can’t wait to try it myself! Can I just say that your pictures are so awesome, really wow, they are so beautiful! looks delicious! Glad you’re starting to feel better! Where do you buy probiotic powder from? This is a great post. These days too many people look at these celebrity pictures and articles about how quickly they have bounced back to their before sleeves. Guess what it’s all propaganda and it’s wrong. Your body has had a major renovation and tenant these past 9 months. Your body is now in a state to nurture this new person for as long as needed and is definitely not meant to slip into a bikini within 5 weeks. ( besides they have nannies, chefs, maids,personal trainers, etc). Think of all they have missed. If you want to spend a morning/afternoon cuddled in bed with the little one do it. If you are a cranky zombie from lack of sleep, it is normal. Your hormones, along with your body, have been all over the place and it does take a long while for them to settle. So, to try and come to my point, as a Mom and Grandmom, I say, be kind to yourself, sleep whenever the baby sleeps, and enjoy you newborn. Don’t worry about others opinions and trust your instincts. If you think something is wrong or off, talk to those you trust. The time will fly by and you will hardly believe how fast your little grows. But, you probably already know all this. Thanks for the great smoothie recipe! I love your creations. Regardless of the digestive benefits, this smoothie looks amazing! It has all my favorite ingredients! Yum! This looks like the perfect smoothie for me right now! My body needs a healthy boost of energy and proteins. Love that beautiful green color! I make a similar breakfast smoothie when i want to jumpstart my digestion as well! Mine is coconut water, pineapple, banana, ginger, lemon, cilantro, mint, & any type of leafy green I have on hand or wheatgrass powder. This looks delicious. People are always asking for ways to increase their energy, especially in the mornings, and especially before workouts. 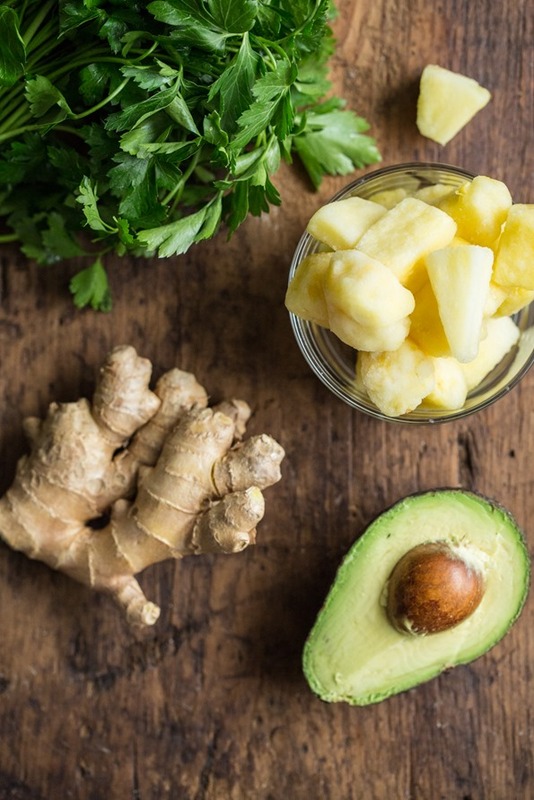 You had me at ginger, but pineapple is the key ingredient of making any smoothie work. I’ve had some miserable adventures with beets, or some such veggie, where the only thing that could save it was a nice chunk of pineapple. I keep them around just for this reason… and they are tasty. My digestion was also out of whack for a few months post baby and it’s taken me this third time around (3 boys under 5!) to figure out something that works well for me and that’s a FODMAP diet. It’s what some people who suffer from IBS follow and it’s so interesting to learn about. I think even if you didn’t use it, you may be interested in reading about it from a nutrition stand point. It also sounds like you are doing a great job at being a mother, and I can only imagine how intense and wonderful an experience it is… and my imagination probably can’t even get close to the real thing! This looks awesome! I’m making this ASAP! What kind of probiotic powder did you use? Give yourself some time and patience. I did not feel “back to normal” until my child was 18 mos old. The shift is hormonal, thus gradual. Getting any hemp based food products is a bit difficult in New Zealand, what would you suggest instead of hemp hearts for protein? Would almond butter taste funny? This smoothie looks so refreshing. I love putting ginger into most of my cooking and the combination with pineapple is just gorgeously refreshing. I used cilantro instead of parsley, because that was all I had and added about a cup of spinach. Can’t wait to make it again tomorrow for breakfast. Definitely one of my favorite smoothies. Is it ok to use canned pineapple sometimes? I can’t remember the last time I ate canned fruit but I live in Germany and I can’t always find pineapple. Here you can only really find fruits when they are in season. I can’t remember the last time I saw a pineapple at the market. I know that generally fresh is always better, but just wondering if anyone has some input on the occasionally canned fruit. Hi Angela! Do you have any suggestions/advice re: probiotics in Canada? What brand(s) have you had success with? That look absolutely fantastic! Looks perfectly creamy! I’m dying to try it out. Hey Angela! I made this just today and it’s delicious! I love the smooth and creamy texture. It’s just sweet enough, and I love the addition of parsley. You mentioned feeling out of sorts postpartum. Have you tried Sepia? Its a homeopathy medicine and it does wonders postpartum. I felt like I was exhausted and out of sorts until a friend who is a Doctors wife recommended it to me. You can get a low dose at health food stores from Boiron or go see a naturopath doctor for 200 dose. You will feel the cloud lift and your energy and libido rise again! This is a great post. Look forward to A future post on the tea you’re having daily. A post on how you get sugar cravings under control would be really great too please. I don’t have a baby (yet) but the lack of sleep from crazy work hours has me craving sugar ALL the time. You’re right, it IS a vicious cycle. Thank you for all you do & your honesty! This smoothie looks amazing! I have digestive issues so I’ll be trying this out soon. Love adding ginger to my smoothies. Where did you get those glasses with the gold rims from? So pretty! WOW! This shake was incredible, really loved the gingered added. I am going to have this for breakfast a few times per week. I’m currently drinking your Happy Digestion Smoothie, it is creamy and just plain yummy. I’ve never been a big fan of parsley in my smoothie, but (for me) the amount called for is perfect, not overpowering. I did have to use coconut milk, skimmed of it’s fat, as I didn’t have coconut water. Unlike many of the posts I’ve seen, I’m not a mom chasing after a toddler . Just the opposite actually, menopause is what is zapping my energy and a sinus infection. Decided the health benefits of this drink might be just what my body is in need of. What a wonderful post, Angela. I have a hard enough time balancing my own life sans baby and can’t even imagine what it’s like adding a bundle of joy to the mix. Congrats on striking a balance, and thanks for sharing such a delicious-looking smoothie. Really can’t wait to make this, as I’ve been going through my own digestion issues. Cheers! The baby pictures are so cute! I was in so much of a fog with my little(now 4yrs old) I did not have any professional pictures taken of her at all. I too got in a vicious cycle of sugar, no sleep, caffeine.. repeat. Thank you I think if I had read your post four years ago it would not have taken me four year realize I what I was going through was normal. The blogs I read at the time emphasized the joys of motherhood, but glossed over the unhealthy habits we can get locked into. Thank you for your honesty. I will have to try the smoothie, it sounds very good. I would also like to see the tea “recipe” I am in desperate need of a coffee replacement. I really enjoyed this smoothie. I love avocado in smoothies for the creaminess it provides. I have to say I was a little nervous about the parsley and didn’t put in quite 1/4 cup. I shouldn’t have worried. The pineapple is so sweet, and the ginger gives it a nice zing – I didn’t even taste the parsley. Next time I will make it as directed! I used fresh pineapple and I’m happy that I have a ton left to keep making this every day for at least a week! I totally agree concerning the pregnancy blocking out everything postpartum. Part of it is our own incomprehension of what lies ahead but a lot of it is in the expectations we put on ourselves. Two years after having born my child, I am much closer to my previous self (still lacking sleep sorely and still a couple pounds heavier) than I was at its five months. Media recently asked a musician how she got slim so quickly four weeks after giving birth and she was like I am 30 pounds heavier and you do not want to see my belly. But of course they printed that she was back to her old slim self. Even though you are now writing about this very openly, your blog has also added to the myth on my side of getting back quickly with regular blog posts and great pictures of yourself and talk about an avocado. Seriously, I was wolfing down all kinds of cake and huge portions when I was still breastfeeding, an avocado would not have done the trick. This is not meant as an offense but an analysis, as I think this urge to get back on track a) allows us to endure a pregnancy b) keeps us sane and going for the first weeks that makes us aspire our before selves. Plus, I am aware that you like many others only post on small parts of your life and we tend to fill in the gaps and if we are insecure we tend to do so in a glossy way. But I think it would be a great goal for all of us to aspire a more balanced picture and to ask ourselves about the impact our presentations of ourselves have on other women, thereby hopefully achieving a more rounded picture of the situation. I have a two year old and a work full time job and we always get dinner on the table = I have it together. But I also have days where I have to do a mad dash from daycare to work with baby wipes and mittens still in my pocket, the stroller forgotten in daycare building, making do with dry shampoo and hoping no one will see the spit on my jacket or come by our house which looks like post hurricane = I do not have it together at all. Both are the truth. I wish you all the best with your baby and want to alert you to the fine line between postpartum overwhelmednesss (is that a word) and postpartum depression – just in case. NO ONE can warn you or prepare you enough for how difficult life with a Baby is. The fact that you are still posting recipes and blogging throughout it is beyond me! AND testing for your next book! My daughter is going to be three and only now do I feel like my “old” self – but with more pride, power and sense of accomplishment. Delicious new green smoothie, I loved it! I’m going to do it again tomorrow for sure. Thank you Angela! I can’t wait to try this. My digestion has been totally out of whack too since having my baby 5 months ago. Just curious, are you thinking about posting homemade babyfood recipes? I haven’t started solids yet but will in the next 4 weeks. Angela – I love your recipes and especially cannot wait to try this one out. I have struggled with IBS symptoms the past few months after having a major surgery and I am seeking out ways to help digestion too. Do you take any plant-based probiotics to help with your symptoms? Or do you just stick to letting recipes like this smoothie do the trick? Yum! I love the combination of the pineapple and ginger. This is definitely my new favorite smoothie. This is an incredible smoothie! Thanks for the recipe! Seriously one of the best smoothies I’ve ever tried. I’ve recently figured out I’m lactose intolerant so I’m trying to be as kind to my tummy as possible and adding hemp seeds to this in the morning makes the perfect breakfast smoothie and keeps me satisfied all morning. I am so grateful for this newfound recipe because it’s DELICIOUS!!! Thanks Angela! Every recipe of yours I’ve tried has been a hit in our household! Creamy, decadent, delicious, perfection. Rather than going to the store, I left out the avocado and used unsweetened vanilla almond milk in lieu of the called for liquids. I also added several packed cups of spinach, extra ginger, and some stevia. Absolutely divine. Hands down, one of the best smoothie recipes I have ever tried. This looks awesome. My brother is getting married in 4 weeks so I’m looking for light meals that will keep me full but not cause any bloating and this will be perfect. Do you think I could use mango instead of pineapple? Yum! I’ll be sure to try this out! I made this a couple weeks ago for myself and my mom. When she took her first sip, she exclaimed, in a very surprised voice, “It tastes good!” It was her first green smoothie and I think I might have her hooked. :) Thank you for your delicious and inspiring recipes! I’m definitely not pregnant but have some digestive issues from time to time. This is AWESOME. Thanks. Tried this recipe this morning and i gotta say it tastes as good as it looks! I just made this smoothie, but without pineapple, and instead, half an apple! I also blended the lemon in with the smoothie haha but it’s very delicious! I did add the spinach, and I’m glad to have a little bit of my daily greens in this smoothie, it’s very good! Thank you!!!! This looks so yummy! I think i’ll give it a try tomorrow morning! I have a feeling I’ve just discovered my next hangover cure! Thanks for sharing this, will be making it very soon! This recipe turned into an instant fav! I dream about it – it’s wonderful. The perfect amount of goodness to please the palate and the tummy! Thank you for sharing and for such an amazing blog! Sounds great, I am going to the store to pick up some of the ingredients and making it today. :-) Thank you for sharing this recipe. Drinking right now – yummy!! I added spinach like you suggested and just chopped the ginger and let the vitamix do the work. Turned out great. I tried this but replaced mango with pineapple because I had it on hand. Had to add lemon and a little more ginger to curb the heavy parsley taste that I assume the pineapple would’ve. Still, tasty and easy to chug! Yum! You may want to look at low fat high carb plant based diet, like the diet from John A. McDougall or the 80 10 10 raw vegan diet, or a combination of the two. I noticed you use a lot of fat in your recipes. Maybe those sugar cravings you are talking about come from the fact that you do not eat enough carbohydrates. Thank you for this recipe / drink / smoothie idea. Love it. Helping me tremendously. I really want to try this, but I am allergic to ginger AND bananas. Do you have any substitution suggestions? I made this smoothie this morning and my husband and I both think it’s one of the most delicious smoothies we’ve tasted! It was very light and refreshing. Thank you for this recipe! I will definitely be making this often. YUM! Here i have got some good ideas about a healthy smoothie preparation. All of these ingredients used in this recipe have great nutritional value. Thank you. Just got a Vitamix for my birthday, and decided to make this as my first smoothie in it! Delicious. :) Great to have a smoothie with so many health benefits! I have just made this drink for the first time, it was absolutely delicious. How many calories does this shake have? How does this affect people that are not and have not been pregnant? Just recently found your recipe for Low Fodmap Pumpkin Spice Latte. It is so good. Lots of spice flavor which is nice. Recipe calls for 1/2 c. maple syrup, but because I don’t use sugar in my coffee, I found it too sweet. Will adjust accordingly. My daughter loved it as well. Have been following the Low Fodmap Elimination Diet for awhile now and it was nice to find this, thank you. Careful with too much parsley, ladies – it can dry up the milk supply! I’m allergic to pineapple – is there something I can substitute for that? everyone is so pro coconut everything but I have a serious allergery to coconut anything, Help what can I subsitute it with. Nut anything is a dangerous thing. Hi Lorraine, I’m sorry to hear about your allergy! You have a couple substitution options for this recipe. You could replace the called-for coconut water with just plain water (I’ve definitely done this before); it won’t be as sweet, so I’d recommend tasting and adding a touch of liquid sweetener if desired. Or, you could replace the coconut water with juice of some sort — pineapple would probably be a great substitute here. Hope this helps! Great smoothie recipe!! Love it. I add mint like you mentioned on the notes and I have to say the combo between parsley and mint is amazing. Thanks for the great recipe. As always I find your site has the best and truly tested recipes. When I stray, I end up with something kinda gross that clearmy the author regergetated. I followed your advice and bought a Vitamix this week that is unbelievably better!! This smoothy is pleasantly smooth without anything overpowering, and with a soft heat from the ginger. Thank you again for your magical touch with food and ability to share it. This was great for putting a major dent in the parsley I have in the fridge. I’m in for a happy gut garden! This is a great smoothie recipe! Digestive health is so critical to overall health and wellness. You can even add in healing supplements and vitamins, etc. Makes for a great breakfast! Hi there! What kind of probiotic powder do you use?? Hey Amy, I’m currently using Flora Udo’s choice super adult probiotic, but I’ve only been using this one for a couple weeks now. So far so good I think. What a great way to start morning with this smoothie.I substitute this smoothie to my daily breakfast meal! Great for my digestion especially that I’m working out! So great!! It is filling and so yummy. Great for a breakfast smoothie. This recipe is so delicious. I’ve always struggled with regularity and this recipe is a delicious stoolution to my problem! Hey Donna, I hope you enjoy the smoothie if you try it out! Hey Brooke, Oh such a great question! I find that smoothies with banana in them don’t tend to sit very well overnight, but ones without banana have a better chance. don’t have banana in them and might be good ones to try! I’d love to know how it goes. Wowza, this was awesome! I just made this for my husband; he’s finishing up a round of antibiotics, and dealing with the ensuing sensitive stomach. He’s not a great fan of parsley, but I’ve tried enough of your recipes that I trust you implicitly. :) Sure enough, we both loved it! aww thanks Erin! That made me smile. Sending healing vibes to your husband! I was on antibiotics over the winter and I can relate to having a super sensitive stomach after. It takes a while to recover. Thanks so much for your comments and this article. I appreciate the time you put to answer on all of questions. Personally, I prefer avocado in smoothies for the creaminess it provides. Hi, I’ve been dealing with h.pylori and trying to build my digestive system up gently. I have heard that veggie fruit smoothies may not be the route for me by a ND. What do u think? Also, what is s ur take on foodmap foods being avoided during this build up?